The institution that sponsors the Nutrition and Dietetics Program is the University of Puerto Rico (UPR), Río Piedras Campus. The UPR System includes eleven institutional units located across the island of Puerto Rico (PR). The Río Piedras Campus is located in the San Juan metropolitan area and comprises more than 250 acres with over three million square feet of space, on which more than 150 structures stand. It is the oldest and largest campus in the University of Puerto Rico System, offering the island’s most complete and varied academic programs at both undergraduate and graduate levels. 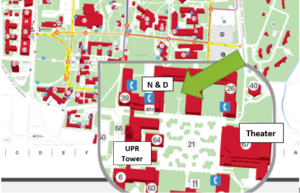 The DPD is located in the Home Economics building also known as ED, it includes two food laboratory facilities under a USDA grant approved to the Program in 2011. The results of this program include two redesigned and remodeled food teaching laboratories for Program courses and redesigned laboratory experiences for seven courses that will use these facilities. The office of the Nutrition and Dietetics Program is located at the first floor of Felipe Janer Building (EFAN-104), which is close to the Banco Popular de Puerto Rico (BPPR) branch office. The Nutrition and Food Science Laboratories are located at the first floor (EFAN-105, 109) and the classrooms are on the second floor of the EFAN building (EFAN-205, 207, 209). At the third floor there is a classroom (EFAN-302) where the members of the Círculo de Dietética gather for meetings and activities. Our biochemistry laboratory is located at the fifth floor of the Education Faculty (NEP-577) in Eugenio María de Hostos Building. Project to renew the science and food laboratories of the Nutrition and Dietetics Program subsidized by the USDA.